To cynical television viewers, fundraising telethons can be nightmarish marathons of show tunes, dance acts and maimed children gasping over puppies while sleep-deprived celebrities sob in the background. On the other hand, all that tackiness works — it keeps the phones buzzing and the money meter humming. In 1983, Donny and Marie’s Osmond Foundation decided to improve on the concept and founded the Children’s Miracle Network (CHM), which facilities the staging of telethons for pediatric medical facilities. One reason that some telethons turn out to be so hokey is that certain markets may have a very limited amount of local entertainment. With the CHM, all members have their telethons on the same week-end. But the telethon in, say, Little Rock may have only enough local material to fill 20 minutes in an hour. As a CHM member, for the other 40 minutes, it goes by satellite to the main CHM event in Orlando, where Donny or Marie or Mary Hart or John Schneider could be performing. The foundation is paid a fee by the hospitals and, in exchange, provides access to national sponsors and, for promotional purposes, national celebrities. Today, there are 160 North American facilities under the CHM umbrella, and BC Children’s Hospital is number one — ‘has been since 1994. How can that be?, you ask. BC’s population has only just hit four million and we know that Americans are way more generous when it comes to supporting hospitals. And it’s true that there are hospitals in markets like Chicago, New York and Los Angeles which take in $60. million a year. But that money is gathered through planned giving, where corporations and individuals make long-term charitable commitments; and through major gifts from estates, trusts and foundations. Where BC Children’s Hospital wins out is in annual giving. Then you ask: But, if our government uses our tax dollars to pay for our hospitals, why do they need more money? John Morton, Director of Marketing & Communications for the BC Children’s Hospital Foundation, says that that is the question which he’s most often asked. And that its answer is the reason that there has to be a foundation in the first place. Although there has been a hospital for children in Vancouver since 1897, BC Children’s Hospital (BCCH) has officially been in existence since 1947. It is the only children’s hospital in the province (Ontario has three) and it is charged with providing BC with leadership in clinical care, access to specialty health care and research. It is the provincial centre for pediatric trauma, critical care, neonatology, cancer treatment, kidney transplants and the training of medical specialists in child health care. Last year, the hospital saw 139,000 patient visits (65% from outside the Lower Mainland), its ER treated 32,000 patients, its staff cared for 600 premature infants and critically ill newborns. One thousand cancer patients were treated last year — it sees 110 new cases each year and 75% of patients survived last year, up from 20% in 1988. In 1997, it performed 86,000 surgical procedures, including 200 open-heart surgeries and 20 bone marrow transplants, and it has BC’s only MRI scanner (which is used by other hospitals). It operates 40 ambulatory clinics and 162 out-reach clinics, provides treatment for HIV-infected women and children, and runs a vaccine evaluation centre, a family resource library and an injury prevention program. All of this, of course, costs bags of money — $154 million in 1997. Raising money for the short-fall would, some may think, be easy — you produce pictures of cute sick kids and ask for the dough. Who could refuse? What possible argument could there be against wanting to make children healthy? 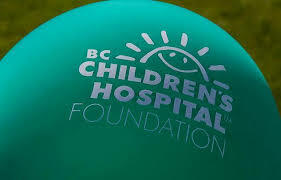 In fact, fundraising is a hugely competitive business, and BCCH competes with 1,000 active BC charities. Most charitable giving is based on emotional appeal, and most charities are targeted in that appeal — if your spouse has kidney disease, you would be more disposed to giving to the Kidney Foundation; your passion for animals would direct your money to the SPCA. The two charities which are so broad-based that everyone feels good about supporting them, though, are the United Way and BC Children’s Hospital. But fundraising is expensive and the United Way is a huge organization with lots of money to spend. The answer to what could be a David-and-Goliath situation for BCCH is two-fold — it maintains innovative communications programs and it thinks of itself as a for-profit business. BCCH raises funds in a variety of ways. Smilewear, or branded apparel, is sold in banks, retail outlets, over the BCCH web site and at the hospital’s gift shop to bring in $100,000.00 a year. Financial gifts come from individuals and corporations. But where BCCH comes out of the gate is in annual telethon fundraising. And although about $250,000.00 is raised each year through call-in donations on the telethon week-end, the bulk of annual funds comes from activities conducted throughout the year for the telethon. And this happens through what Morton calls ‘systemic fundraising’. The foundation divides its telethon fundraising cabinet into industry sectors and recruits volunteers from these sectors — Tourism/Hospitality, Information and Technology, Construction, Transportation, Retail/Wholesale, Forestry, Finance, Real Estate, Mining, Energy, Professional (doctors, lawyers) and the Public Sector. In each sector, one volunteer becomes chairman of the committee for his or her industry, recruits more volunteers from that industry and is responsible for that committee’s activities. In addition, the Chinese-Canadian, Indo-Canadian and Italian-Canadian communities have their own committees, and there are 13 additional committees to handle donations management, catering, production etc. As the telethon is held each June, the 28 committees start planning in October, and all funds raised over the next eight months become part of the telethon total. The foundation provides a relationship manager for each committee to provide support, but the committees are pretty much left to themselves to raise funds in their own way. And they don’t need much help. The Finance committee raises about $1. million by selling hot dogs and Sunny Bears (the hospital’s mascot), and by hosting a stick-on toonie campaign at teller wickets. The Tourism/Hospitality committee conducts a chocolate hedgehog campaign, a Coffee for Kids campaign and a golf tournament. There is a Mining For Miracles campaign. Canada Post sells cook books. A Slo-Pitch tournament brings in $420,000.00. Then there is Jeans Day, where people buy $5. buttons and, if they wear the buttons, can wear jeans to work on a designated Friday each year. Jeans Day alone raises $620,000.00 and it was an idea that came from Bryant, Fulton & Shee, which has been the foundation’s advertising agency, on a pro bono basis, for the past ten years and which gets a lot of credit for making the telethon fundraising campaign the success that it is. Because communication is the key to successful fundraising. If you’re a non-profit organization, people have to know why you exist, what you do, why they should give you money and what you would do with it. You have to create awareness of yourself as a brand, and you have to keep reminding people that you’re still doing what you do and that you still need money. It’s not easy, given the competition and our persistently unstable economy. After the BCCH foundation joined the Children’s Miracle Network in 1986, its fundraising plugged along at a steady pace, hitting $2.7 million in 1990. Public awareness of the hospital and its activities grew, as did the foundation’s work with Bryant, Fulton & Shee but, in 1993, it was decided that a heavy branding campaign was in order. A new strategy was developed, and it is this strategy which remains today — the strategy which propelled BCCH to the top of the telethon fundraising heap and keeps it there still. Two campaigns were launched, both using transit, radio, TV, outdoor and poster advertising. From July to April, a general awareness campaign does not ask people to donate money, but it reminds them that the hospital is a provincial care-giver which puts smiles back where they belong. The second campaign raises awareness of the telethon. It is a call to action, encouraging people to support the telethon by participating in the committees’ telethon-related activities. One of the key components to the success of both campaigns was the 1993 incorporation of direct mail. There are now direct mail campaigns in the spring and fall. Each is a three-wave mailing: three consecutive letters are sent to 50,000 households, most of which include current or past donors. The mailings include wish lists, i.e. ‘this is the piece of equipment we need, this is what it would do and this is what it costs’. There have been notes from parents and children — such as ‘I want to be a airplane lady,’ or, from Brandon, ‘I want to be a firman’, with an accompanying photograph of Brandon in a firefighter’s suit. The goal is to create what fund-raisers call ‘the warm fuzzies’ — the tug at the heartstrings which opens the door to the bank account. Campaigns we’ve seen lately have included the Superman theme (using the Crash Test Dummies hit song), which points out that too many children discover that they’re not made of steel. There have been taped parent and care-giver testimonials and, recently, Vancouver Grizzly Antonio Daniels warbled hackneyed ballads with the promise that he’d stop if people donate. The print/poster ads have been extremely effective, with arresting images and headlines. The result of the 1993 change in strategy — the heavy branding campaign using the hospital’s sunshine logo combined with direct mail and a strong television presence, created a massive jump in public awareness for the hospital — to 93%. And the resultant momentum has carried through financially: last June’s telethon brought in $5.5 million. As the foundation has an endowment which covers its administrative costs, all funds raised go directly to the hospital– less the cost of staging the telethon which, last year, was $323,000.00. Which, if you think about it, isn’t bad. That’s for a week-end on Global Television, with sets which have to be built, technicians and staff who have to be paid. Then there’s the cost of producing the telethon’s video presentations. Much of the telethon’s visual content is four-minute video vignettes — patient stories including interviews with doctors, nurses, family members. Along the way, comedians perform to keep the energy up and the whole thing is meant to be a happy, cheerful celebration of caring and giving, although events can occasionally alter that. As the telethon is the culmination of all of the committees’ activities for the previous eight months, a good deal of time is also spent on volunteer and donor recognition, which takes the form of on-screen acknowledgments and cheque presentations from committee delegations. There are, of course, the phone banks and, to keep people calling in the off hours, there are Fast Five Minute segments where sponsors give away products to those who call within those five minutes. Callers can have $25.00 donations added to their telephone bills and, this year, the foundation brought in new technology to facilitate increased call-in donations. As mentioned, smaller-market telethons have to turn to the satellite feed for entertainment from the Children’s Miracle Network, which is taking place simultaneously in Florida. BCCH, however, is lucky to have a large talent pool; enough to fill 14 of the 21 telethon hours with local content, so it uses the satellite feed only from midnight to 8:00 a.m.
And what about the rest of the Children’s Miracle Network members? While you would think that the American hospitals would be way more aggressive as fund-raisers, given their lack of choice, Morton says that they’re not yet up to the BC speed. “We go to the Children’s Miracle Network conferences and discuss strategy with other markets. They’re smart, capable people and we learn from them, but many are taking baby steps. They are either not as far along with road or they’re not being innovative. This entry was posted in Marketing & Advertising, Profiles, Public Relations, Television and tagged BC Children's Hospital Foundation, British Columbia's Children's Hospital, Children's Miracle Network, Children's Miracle Network Hospitals, Donny and Marie Osmond Foundation, Fundraising, Health, Mary Hart, Medicine, Telethon.